We have not talked a lot about investing here at Money for College Project. My focus has been on helping you find money for college through scholarships, grants, and student loans. That is still my focus, but with the recent change here on the blog, I have been thinking a lot more about investing. Investing for the sake of building wealth is an excellent goal, but please be careful not to put the cart before the horse. Financial experts, including Dave Ramsey’s seven baby steps, put investing for wealth building near the bottom of your check list when trying to reach financial security. I completely agree. Before you even consider investing, you should have a 3-6 month emergency fund, have paid off all non-mortgage debts (or even your mortgage if you truly prescribe to the no-debt lifestyle), invest 15% of your income into tax advantaged retirement vehicles, and started to save for your child’s education. Once you have completed all of these goals, then you can get serious about investing. I am at the point in my financial life where I have completed all of the above, and am ready to invest. This means that I have a small portion of discretionary income that is free to invest into non-guaranteed securities, with the potential for loss. Granted, I don’t plan to lose anything, but I have always heard that you should never invest money in the stock market that you cannot afford to lose. So with that in mind, I went about to find a discount online broker that would allow me to begin my adventure into investing. For many years I have used ING savings accounts. I initially signed up with them because their interest rates were among the best in the industry, at about 4.00% at the time. However, even with a now paltry 0.8% I have stuck with them because I trust them, and I love the ability to create sub-savings accounts. When I began my search for an online investment broker I went directly to ShareBuilder. I had read excellent reviews on ShareBuilder, and I had seen their advertising for $4 trades online, so I assumed they had to be a good bet. 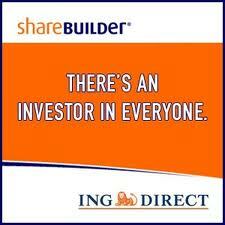 If you already have an ING Savings or Checking account, then opening a ShareBuilder account is incredibly easy. You simply login to ShareBuilder with your ING username and password, agree to their terms and conditions, and then link your savings and checking accounts to your investing accounts in ShareBuilder. This then allows you to easily transfer money from your linked ING savings account into your ShareBuilder investment account. *One word of caution. I almost freaked out when I saw the display screen with my savings accounts linked to my investment account. I freaked because I absolutely did not want my savings to be withdrawn and somehow invested into the stock market and lost forever. It was a rash thought, but still, I freaked. If you don’t like this option which I did not, you can choose NOT to link these accounts, and you can fund your ShareBuilder investment accounts through another bank, or through manual transfer. ShareBuilder has 2 separate pricing structures. Depending on your investment strategy it might make sense for you to subscribe to the Advantage program. If you are an active investor, the examples below show how a $12 per month Advantage subscription might save you money. I would definitely recommend the basic program for a beginning investor, but the final call is up to you. Finally, we get to the reason that I took the plunge and opened my ShareBuilder investment account when I did. When I was researching ShareBuilder I ran across a site that had free money codes for ShareBuilder. I thought they had to be fake, but sure enough, once I opened my account, I clicked on the promotion tab, entered the codes, and they gave me $75 in bonuses. Once you have created your account, click on Overview > Profile and Settings> Enter Promotion Tab> Select Account and enter your Promotion. Simple as that. Here are the two promotions that I used to earn $75 in free money! START50 – Make a deposit of $25 or more to earn a $50 bonus. INVEST122111 – Make a deposit of $25 or more to earn a $25 bonus. Both of these worked for me. I have not gotten the money funded yet, but it was confirmed by ShareBuilder, and they said it would take 4 to 6 weeks for the money to be deposited. Yu also can withdraw the initial investment funds, and you truly did earn $75 in free money! Nice review. I’m only confused on one point. What’s the fee for the Advantage program? 12 bucks? What are the benefits? Just those listed in your chart? @Average Joe — Yes, the fee is $12 for the Advantage program, and those are the benefits listed in the chart. I believe you also get increased access to research and professional analysis of stocks.